For Halloween, we took Aidan trick-or-treating with his friend Sam out in their neighborhood in Long Island. 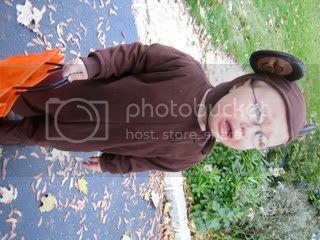 At first, Aidan wasn't too happy wearing his monkey costume...but then we figured out that he just didn't want to wear the monkey feet. After those came off, he was ready to go trick-or-treating! 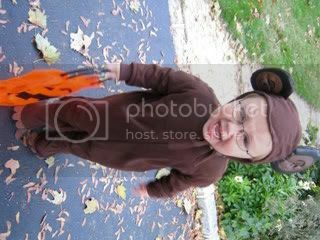 It took him a few houses to figure out what to do, but once he got the hang of it he happily ran up to every house saying "Happy Halloween"!! We can't wait for next year when he's a little older and can really get excited about it! oh my goodness those first pics of aidan crying are priceless! but i'm glad you figured out what he didn't like and that he was able to go out and have a good time! Aidan does not look too happy in some of those pics, BUT HE IS SOOO FREAKIN CUTE! I just wanna sccop him up and hug him! We are a busy family of four. Larry is in his final year of medical school and completing his elective rotations at New Hanover Regional Medical Center. We are living in Wilmington, NC and loving it!